Yesterday morning, this black bear was up in our pine tree. Actually, the bear is about forty feet up, looking down at me as I stood at the base of the tree taking his picture. So what is a black bear doing in our tree? The story starts with our dog, who happens to be named Bear. 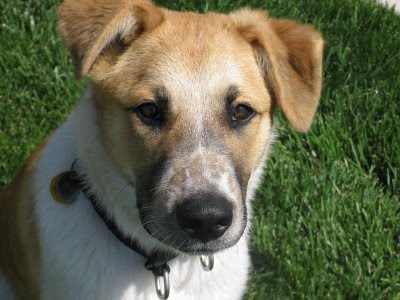 When we picked him up from the Pasadena Human Society he was described as part Akita. We read that Akitas were bred for bear hunting. Hence the name Bear. He's still a puppy, but is going to be a pretty big guy. Yesterday at about 5:30 am, Bear started barking and heading for the back door. He and I walked outside to check things out. We saw the bear standing about 15 feet from us next to a pine tree. The bear reacted in a flash by scrambling up the tree. I could hear the scratching noise of his claws digging into the trunk as he climbed. He went straight up to some limbs about forty feet off the ground. This picture gives you an idea of how high the bear climbed. If you look carefully you can see the bear resting on the second set of limbs up from the ground. Though he kept track of us (of course I woke everyone up to come out and see the bear in the tree), the bear did not seem concerned. He nonchalantly hung out. He stood on one limb. Then he stood on another limb. Then he went back to the other limb and sniffed around in the pine. Then he put his head down and went to sleep. According to the Los Angeles Almanac, 150-500 black bears currently roam the Angeles National Forest. Interestingly, black bears are not native to our local mountains. The bear native to our area was the grizzly. However, the fierce grizzlies were eradicated by at least 1916. Some time later, authorities wanted to reintroduce bears to our local mountains. Instead of grizzlies, they chose the kinder gentler black bear. In 1933, Yosemite rangers brought in 11 black bears who are the forebears of our current bear population. Black bears are omnivores, but eat mostly vegetation. Reportedly their adult weight can range from 90 to 600 pounds. They can run up to 30 mph, are good swimmers and great climbers. With their upright ears, black bears are the inspiration for teddy bears and for Winnie the Pooh. In foothill areas bears are sometimes reported coming down into the neighborhoods in search of food. This seems true particularly on trash day. We've seen signs of bears around our house before -- a broken fence, trash cans knocked down and a some really foul bear remains. But, I never expected to have this kind of encounter! As interest grows in all things green, there is a resurgence in chicken keeping. Just a generation ago, chickens were a normal part of everyday life. My father's family kept chickens. I grew up with chickens in our neighborhood. It was just accepted. I don't recall any problems. So, Lolo (pictured above) and I were hanging around the yard this weekend. It has been a year since she and her five sisters joined our family. We agreed the whole experiment has been a great success. The chickens have been easy to care for and just plain old fun. We clean up every couple of weeks so they don't smell. Our hens are relatively quiet (no roosters). They don't wander into neighbor's yards (although a neighbor's dog got into our yard one day and gave us all a scare). They give us great compostable droppings for the garden. And, best of all, they lay eggs that are more nutritious and less taxing on the environment than those trucked into town. So, what's the beef with chickens? Why aren't there more around? We did a little research and it turns out that chicken keeping in Pasadena often runs afoul (or is it afowl?) of laws that were passed in 1956. Lolo and I agreed that the old laws are outdated and need change. Why the Nix in '56? Pasadena's chicken laws are part of a series of ordinances that were passed in 1956 to prohibit certain farm animals and severely limit others. Cows, pigs, and roosters are prohibited. Goats and horses are extremely limited. 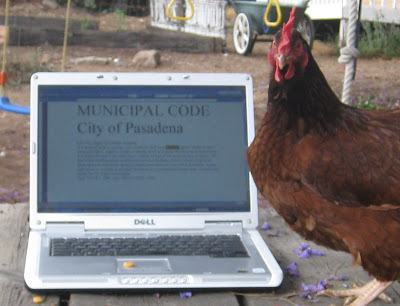 Restrictions on chickens and other fowl are so severe that any fowl is prohibited in most Pasadena neighborhoods. It was only slightly before my time, but most likely Pasadena's animal control ordinance took hold amid the twin pressures of post-war population growth and the drive to modernize. In an era of space exploration, TV dinners, and homogenized everything, there was probably no room for farm animals in a world class city like ours. Better a Chimp Than a Chick? Though most Pasadenans cannot own a chicken, you'll be glad to know you can keep monkeys. The city code allows residents to own any "monkey, ape, chimpanzee, or any animal of the monkey type" as long as as you leash the animal when you go in public. I don't want to offend the pro-monkey forces, but, does it make sense to allow monkeys while outlawing chickens? Urban chicken keeping is a growth industry. In the year since I've been keeping this blog, I've been surprised at the number of people who have inquired about our chickens. East Pasadena's Centinella Feed sells so much chicken feed they have a hard time keeping it on the shelves. Nationally, an urban chicken movement is fast pecking away at prohibitions against chicken keeping. There are a lot of great sites to visit on this topic including: Homegrown Evolution, Backyard Chickens, The City Chicken, and Ann Arbor City Chickens. It is time for Pasadena and other cities to take a look at old laws limiting chickens. As part of its program to be a Green and Sustainable City, Pasadena says it intends to "support the public health and environmental benefits of locally grown organic foods." Loosening the restraints on chicken keeping is a good way to pursue this goal.